Super Dungeon Explore, the world's first chibi anime strategy battle game is ready for order from Soda Pop Miniatures! Go head-to-head with your party of brave adventurers, or play as the dungeons evil master summoning hordes of minions to battle over who will rule the world of Crystalia. Super Dungeon Explore comes complete with over 50 finely crafted Soda Pop miniatures, full rules, cards, dice, and battle maps to start playing! Okay, so basically, without the expansion that is still not out you basically have one adventure straight out of the box that can be played in different rooms of the same dungeon. Every time you play, it has to be the same monsters. 9 time out of 10, if you’re playing with 4 heroes and the GM/Console/Overlord the heroes end up being the same or 3/4 are the same. All the map tiles are pretty but they really don’t do too much as far as mechanics differently. So, without any REAL flavor besides some japanime video game it’s the EXACT same adventure every time. This is actually where this game SHINES. If you love miniature games, here you go. So, all the monster and heroes come in different pieces and you have to glue them together and you can even give certain things your own nice little flair to them. All the monsters and heroes look fantastic after their glued and pieced together. The dungeon tiles are beautiful. The equipment even has this cool little thing where you can artfully add them on to your character cards. The production and design of the game is overall amazing. This is, very possibly the single WORST rule book I have ever read or looked at. Rules about very similar things are scattered all around it and you better read it like 10 times before you pick up the pieces or some rule is going to need to be clarified in the middle of a game and you’re going to take like 20 min. trying to find out exactly what you need to know because you basically have to thumb through the whole thing 3 times to figure out all the rules about one tiny thing. I play used to play Warhammer:Fantasy and Descent 1st ed. and those games were easier to learn. The one saving grace of learning this game is that all of the character abilities/buzz words on attacks are usually printed on the back of the hero/monster cards. 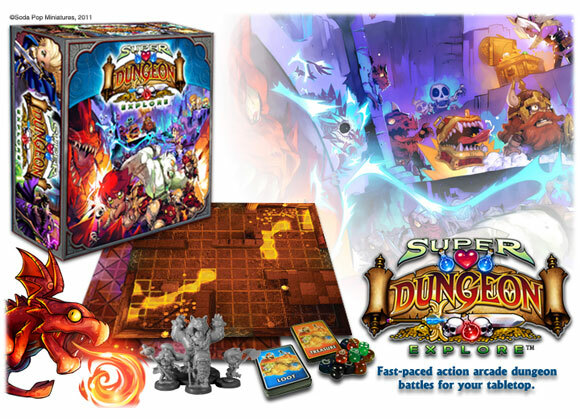 Super Dungeon Explore is exactly what it set out to be, a hack and slash video game on a board instead of a screen. This game was really fun the first 2-3 times I played it. I have GIANT hopes for this game when/if an expansion or two come out for it. Being able to very up the monsters or tiles a bit more and get rid of the single cookie cutter dungeon aspects, a little variance and a bit of replay value would be GREAT and probably bump my 5/10 to a 7 or 8/10. Super Dungeon Explore is a dungeon crawl (mostly) co-op miniatures game with anime inspired characters and monsters, based on a video game. Whew, that’s a mouthful. So what does it bring to the table? It requires between two and six players to play. One player will play the “consul” (the dungeon master basically), and the others will choose heroes to play. There are a variety of heroes to choose from, covering all the usual dungeon tropes. Dwarf, elven ranger, thief, barbarian, scorceress, paladin, healer, druid. The players pick what kind of crawl they wish to embark on. Two heroes against a mini-boss, three heroes against a boss and mini-boss, or the super mode, 5 heroes against two mini-bosses and a boss. The consul then lays out dungeon tiles, and selects “spawn points”. The spawn points work like the old video game Gauntlet, in that they continually produce more monsters until they are destroyed. If the heroes kill all the spawn points, or run out of time, the boss comes out, and the final battle begins. Kill the boss, and the heroes win the day, kill the heroes, and evil wins. At first glance, the game looks pretty simple, however, there is a great deal of depth to the strategy in the game, both on the side of the consul, and on the side of the players. The game really becomes it’s most exciting when playing with a group that has played a few times. As the consul, there are a ton of options as to how to try to kill the heroes down, and an experienced consul can easily wipe out inexperienced players quickly. However, a group of players that understand the mechanics of their heroes suddenly turn into a monster-killing machine, and that is when the game really comes into it’s own. Now the consul player has to constantly think and plot and move around, forcing the players to do the same, and it becomes a tightly fought contest to the last turn. The rules are remarkably simple for such a deep game. Attacks and defense are made with a number of colored dice with varying numbers of stars on them. For example, you might roll 3 blue dice for attack, and the consul might roll 2 blue for defense. If the attacker gets more stars then the defender, he does one wound (regardless of how much you beat the roll by). Things like range are very simple, if you have an 8-square range, you just count out 8 squares, diagonals, etc. Every rule has been well thought out so it is easily resolvable, and extremely easy to remember. You can teach a new player the game in mere minutes. Mastery of the game is what takes much longer. The game ships with a huge pile of highly detailed miniatures. For the painters in the audience, this is a great boon. The miniatures are well made, and a ton of fun to paint. The game becomes beautiful, and always draws a crowd of interested onlookers. But, fair warning, the base game comes “unassembled”. You will need to spend a few hours gluing together all the little figures before playing. This can be frustrating for those who aren’t good with superglue. The good news for that crowd however, is that all the expansions are shipped fully assembled now, so those of you who hate assembly only have to do it for the base set. The first time you play this game, it will take forever. Players will hem and haw about what to do next, and a 5-hero game with all new players will probably run you about 4 hours. This often leads to some players thinking the game is too long, and there is too much time between turns. With experienced players, the game is not nearly as lengthy, a 5-hero crawl takes around 1.5 hours. I actually think the game plays best with 3 human players and one consul doing a 5-hero crawl. This avoids the problem of player elimination, because the players can easily hand off one of the two spare heroes to the now-dead player, and keep the interaction going. Is it fun? Oh my yes it is fun. It’s fun as the hero, to smash down the evil spawn points and kill the mighty boss. Shouts and cheers usually erupt when big monsters are killed. The players start to really work together and devise great strategies to win. As the consul, you are constantly busy. You have 30 or more monsters to keep track of constantly, as well as ever-changing conditions in the dungeon as the heroes wreck your plans. But you can still win, and then you alone can gloat. There are currently two major expansions for this game, as well as a bunch of one-off characters and mini-bosses available. The Caverns of Roxor add turtles and fire monsters, as well as a very nasty fire boss. Von Drak Manor adds undead, as well as witches and a giant spider, with a vampire boss (who is a little weaker than the other bosses in my opinion). Each expansion also adds three new heroes to the game, giving the players more variety to choose from when playing. Both expansions are excellent, and any serious consul will own them all. The miniatures are wonderful and fun. They are great fun to paint. The rules and mechanics are extremely simple. Very easy to learn. The depth of the game offers great replayability. You get better at it with each play, and can really feel yourself “getting it”. The game is filled with exciting moments. When a hero picks up a great piece of loot, everyone cheers. The company is dedicated to the game. They have updated rulebooks and FAQs online you can download with corrections and clarifications. The game draws a crowd whenever it is played. Lots of expansions to increase the variety of the games. The miniatures are unassembled. If you are a painter, you will love this, if you just want to play, you will hate this. First few games will take forever. Player elimination can make the game un-fun. If you have all the expansions, transporting the game can be difficult. There are *alot* of figures, and you will likely need to come up with a storage solution, doubly so if you’ve painted them. It’s sometimes difficult to convince players to give it a try. However, if you play at a game store or similar, you will find it draws alot of attention, and the problem goes away quickly. In summary, this is one of my all time favorite games. I can play it endlessly. The depth of strategy makes it a blast to play over and over again. I cannot possibly recommend it enough, but I have to forewarn you: Once you start loving this game, you will *need* all the expansions, because, yes, more monsters, and it is a gateway drug into the hobby of painting. Additional note: Soda Pop Miniatures has also recently posted a rules addition for an “arena battle” mode. This is a two-player fight to the death between heroes with monster minions. I have not yet tried this mode. The PDF for the rules is downloadable on their site for free, and works with the base game out of the box. I will start this review by saying that if you are not a fan of board games that require strategic thinking or having a typical game run longer than 30 minutes, this game is probably not for you. That being said, let me tell you about all the wonderful things this game brings to the table and why it has become my absolute favorite board game. First of all, I grew up a role-playing game nerd (i.e. Final Fantasy, Secret of Mana, etc.). This game has a very RPG feel to it, which combines elements of Final Fantasy (characters), Diablo (dungeon crawling) and Fallout (battle system). This game is built for 2-6 players (1-5 heroes and 1 dark consul)and based on the number of heroes you play with or the game style you select, can range from from 40 minutes per play to 3 hours. I warn people trying this game for the first time, the first four games you play will take you twice as long as a seasoned player. Why is that you ask? Well, while the rules are not overly complex, there are quite a few! Unfortunately as well (as this is why I gave it three stars above), they are not overly specific or thorough in certain situations. This will lead you to look up several of these rules online (for addendums made by the publisher after the game was initially released). After you get the hang of it though, get ready to play a game that is more addicting than any board game I’ve ever played. Now, the objective of this game is to a) destroy the dungeon mini-boss/boss if you’re the heroes or b)destroy all the heroes if you’re the dark consul. The heroes camp has 8 heroes to choose from with the standard set, but with the expansions and special heroes that exist, this can be expanded to 16 (soon to be upwards of 30 when the Forgotten King and associated warband expansions come out in December of 2014). The Dark Consul has about has 12 ‘spawning options’ to choose from (each of which contain 4-5 sets of unique monsters). This amount of variability is what really draws me to the game because dungeon crawls never get stale. You could play every single day, and feasibly never play the same exact game due to hero/consul combos. The battles are decided by using each of your unique characters special abilities and through a dice rolling system that is simple, yet much more strategic than any other typical dungeon crawling board game. Cons: Rules not overly clear, minis do require assembly (only for the main game — not expos), play cards are a little thin for my liking. I got a copy of this over Christmas and was very excited. The box was full of gamepiece goodies and I enjoy minatures. I do have o say though even my enjoyment has limits and the building of these minis became tedious very quickly. Once assembled though they look great and we are past that hurdle now. The games I played were all 5 heroes and one overlord. I think the estimated time on the box for a game this size is seriously underrated. The game did become drawn out with this many players it seems and I am really looking forward to reducing the number of players down to four. I just don’t think six works unless you have dedicated players who want that type of game. Unfortunately, while game lovers, my family had a hard time staying interested that long. One other issue I had with the game was the boss fight. I was so looking forward to romping on the heroes. It seemed by the time we got to that point though the romping was not going to happen….characters steam rolled my dragon in both games. Al in all its a fun game, kinda closer to Heroquest than it is Descent. I think for long drawn out games though I actually prefer Descent and I am not looking for large player games with this again. I believe with 3 heroes the board wil play wonderfully and I am looking forward to gettting it out again and giving it a roll. We put in a few rules variations to balance out the play and it worked out pretty well. We decided that only one monster portal would spawn each turn after the first, but it was too easy for the party. Starting the party in different locations and adding to their movement speed helped a little, but they still rolled over the boss. Everyone ran past the enemies, teamed up and stomped on the monsters. We didn’t want to put this game into retirement yet, so we made it a rule that each character was locked in their area until they killed at least one monster. This gave the monster player some time to come up with a strategy and put a few blockers in the way. The game went much faster because the monsters weren’t churning out in record numbers and the players got to use their abilities more. My experiences with SDE have been few and far between, mostly because it takes a lot of energy for me to try and start a game. The major downfall I see is the difficulty for units to easily do multiple points of damage, this limits how far the heros can progress and often reduces the game to a painful slog filled with competitive dice rolling. The models are well made and fun, the setting is silly without being too flippant and the “bad guys” are refreshingly varied and fun to play. With all that being said, it is often hard for me to dedicate the 2+ hours required to play a game that has little continuation past the one session. Maybe if they added a campaign system? the gameplay was interesting the best way i can describe it is someone translated the feeling of playing final fantasy or dragons quest into board game form. where this game really shines is the miniatures they are gorgeous and i wish i was a better painter so i could make them look even better. although they don’t come pre-assembled there is a small note on the back of the box that does say some assembly required, but the fail to mention that you need to glue parts together. the worst part of this game however is coming in fresh and trying to figure out the rules. this has got to be the worst written rule book i have ever read. it took me 4 read throughs and acouple of youtube videos to figure it all out . This game has become a recent favorite of my gaming group. Admittedly there is some length to the game with more players at the table. I have play on both sides of the table controlling a player character and the Bad guys. The look on the players faces when you finally summon Rex “the mini-boss” is priceless. There are a lot of neat mechanics in this game that makes teamwork vital and solo adventuring tough! I have enjoyed it every time I have played and the time does go by quickly the more you play and know what your doing! 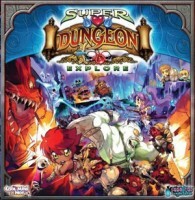 Add a Review for "Super Dungeon Explore"